IT'S never been easier or cheaper to get your cat neutered and microchipped! 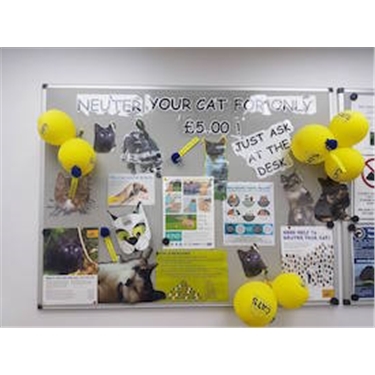 Forth Valley Cats Protection adoption centre launched their £5 Snip and Chip Campaign last month andf since then lots of local cat owners have been taking advantage of this great deal. All eligible cat owners, including students, pensioners and those on low wages or in receipt of benefits, have to do is arrange your voucher and book your cat into one of the participating vets. Spaying or neutering your cat is a simple procedure and it will make them much happier and healthier. Microchipping is a safe method of identification so that should they go missing they are much more likely to be reunited with you. This £5 neutering offer is open to anyone in the FK1-FK21 postcode area. Some vets will charge an extra £5 for microchipping. In Alloa the vet to take your cat to is Betavet in Bank Street. There are also vets in Stirling, Falkirk, and Bonnybridge. Call Lorna, our neutering officer, on 01259 720405 to arrange your voucher. Or ring the centre at Fishcross on 01259 720555. Photo shows the display inside Betavet in Alloa.